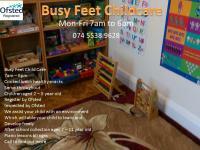 I am an Ofsted registered childminder based in Furzedown. I have been working in childcare for over 6 years (nurseries, care homes, and in schools). My setting is based on the first floor of my house with two designated rooms and a shared garden. I have a wide range of resources for all ages and the day is varied to keep children entertained and to encourage learning. Large back garden with out door play equipment fit for the purpose. Designated room for play area. Sleep area and escape exit front and back. Two minutes walk to bus stop; five minutes to train station; central to Tooting Broadway. This includes cooked lunch, dinner and healthy snacks. I provide local sourced healthy meals and snacks and can meet dietary or cultural needs. Feel free to make an appointment with me to discuss your child's needs. I have 6 vacancies for children aged 2-5 years old.